Anyway, so they have decided to make this young Superman brooding and well, an internationalist. Think of that what you will. Some critics of the proposed Islamic community center in Lower Manhattan, including commentators on Fox News, have linked the project to terrorism by seizing on a Saudi prince’s past financial backing of the imam at the center of the controversy…. We tend to forget, in the West, that the United States has more Muslim blood on its hands than al Qaida has on its hands of innocent non Muslims. I am posting this in the Atlanta airport, where Mrs. P and I are stuck for the next couple of hours. I will spare you the details. But I should be back at the homestead this afternoon. If he is willing, I am considering keeping Aaron on for another week or so. All I really want to blog about is Brett Kimberlin and my vacation — and I am not sure too many readers care about either at this precise moment, given the impending election. Meanwhile, I am mostly ignorant about the news of the last couple of weeks. Also, I am likely to be jet-lagged in coming days, and have two trials coming up. Given all this, I think readers might be better served if Aaron kept on for a few days, until I can get back in the swing of things. I’ll try to contribute something, but I don’t want to generate a lot of posts that will be uninteresting to most readers who are looking for election coverage. I will get to the vacation and Kimberlin posts once we get done kicking the Democrats’ behinds in the upcoming election. It’s good to be (almost) back. Talk to you soon. And enjoy your Halloween. Dress up any way you like, I don’t think you can scare the Democrats any worse than they are right now. Update: Johnson responds. Basically he doubles down, saying I was lying about the Bush Bow and as far as crowd size is concerned it’s Science! Basically he has gone from tearing down Dan Rather, to becoming Dan Rather, refusing to even deal honestly with the criticism. Show the picture, Charles and let your audience decide who is telling the truth. I dare you. Update (II): I have been reminded via email that Legal Insurrection exposed Johnson’s dishonesty on the Bush Bow at the time. And he noticed the magically changing post, too. Finally, a question for all the refugees from LGF coming today. Why isn’t he even talking about the inclusion of an Islamofascist at the Stewart Rally when only four years ago he denounced the man? A long time ago, Charles Johnson’s Little Green Footballs was one of my daily reads. He confronted Islamofascism and dishonesty in the media. He earns a place of honor as being vital in the Rathergate scandal. But man, has he slipped off. It wasn’t just a matter of changing his mind, but erasing the past. It was intellectual dishonesty, for instance in the controversy when Barack Obama bowed to the King of Saudi Arabia. First he posted video that supposedly showed that “Bush bowed too.” Then when called on the lie he told, he added the word “metaphorically” without noting the change in his post. I watched him do it in real time and called him on the change. He lied to my virtual “face” about it with a comment directed at me, and my account was banned, a familiar story. Now he has completely rewritten that post. An estimated 215,000 people attended a rally organized by Comedy Central talk show hosts Jon Stewart and Stephen Colbert Saturday in Washington, according to a crowd estimate commissioned by CBS News. The company AirPhotosLive.com based the attendance at the “Rally to Restore Sanity and/or Fear” on aerial pictures it took over the rally, which took place on the Mall in Washington. It has a margin of error of plus or minus 10 percent. 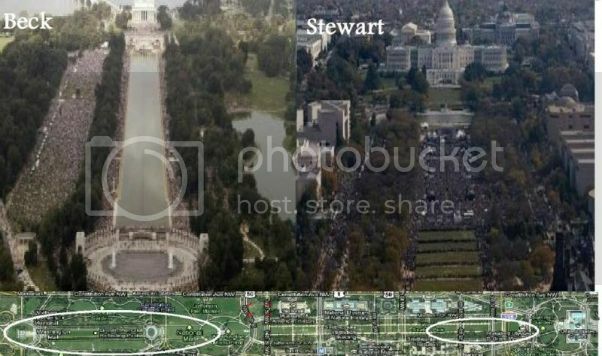 CBS News also commissioned AirPhotosLive.com to do a crowd estimate of Glenn Beck’s “Restoring Honor” rally in August. That rally was estimated to have attracted 87,000 people. Amid criticism from conservatives that the estimate was low, CBS News detailed the methodology behind it here. Well, which should we believe, Charles? CBS news or our lying eyes? About six years ago, Charles, you knew the correct answer to that question. Oh, and don’t bother “disappearing” this post, Charles. I have the screen shot. It’s One A.M. Do You Know Where the Code of Conduct for U.S. Judges is? It began as an amusing story about a technical glitch in some automated phone calls that went out to voters in Nevada. But it has since turned into a discussion of judicial ethics involving retired U.S. Supreme Court Justice Sandra Day O’Connor and her passionate campaign in favor of judicial election reform. A story in Monday’s Las Vegas Review-Journal reported that a significant number of Nevada voters received so-called automated “robo-calls” with the voice of O’Connor urging them to support a Nevada ballot initiative that would change the way Nevada judges are selected toward a merit selection/retention election system. The problem was that the calls went out at 1 a.m. insted of the intended 1 p.m. time. The group sponsoring the calls has apologized profusely and the marketing company that made the error has been fired. But conservative commentator Ed Whelan saw another problem: “Do the ethics rules governing federal judges really permit a federal judge to robocall voters in support of a ballot initiative?” In a National Review Online entry Whelan noted that Canon 5 of the Code of Conduct for United States Judges(pdf) prohibits them from engaging in political activity — except as permitted by Canon 4, which allows judges to speak to the public and to legislators about legal matters and the administration of justice. Whelan, who also is president of the D.C.-based Ethics and Public Policy Center and a former law clerk to Justice Antonin Scalia, wrote that O’Connor’s personal advocacy of a ballot initiative is not the kind of legal discussion Canon 4 contemplates. Ed Whelan and others at Bench Memos has indeed been all over this story for several days. Really just go to October 27, 2010, and then work your way forward in time. Its a lot of interesting stuff. Which is that special breed of explanation that still leaves questions unanswered. Such as, “how the hell do you record a robo-call message and not realize it might be used in a robo-call?” for starters. I don’t think O’Connor should resign, but I think she should tone down her activism on this issue. Update: I am not the first to notice and TPM is apparently the first to dismiss these concerns as “Right Wing.” I didn’t realize that freedom of speech was a “right wing” value. I thought it was a baseline that people on the left and right agreed on. Update (II): Thanks for links from Memeorandum, Hot Air, and American Power. ”I’d try to phone the Ayatollah Khomeini and tell him exactly where this man is,” said Mr. Islam, who watched a preview of the program today and said in an interview that he stood by his comments. And this ___hole is in the rally to restore sanity?! Update (III): Via Ed Driscoll, we get video of Yusuf Islam wishing he could burn Rushdie alive. I never called for the death of Salman Rushdie; nor backed the Fatwa issued by the Ayatollah Khomeini – and still don’t. The book itself destroyed the harmony between peoples and created an unnecessary international crisis. When asked about my opinion regarding blasphemy, I could not tell a lie and confirmed that – like both the Torah and the Gospel – the Qur’an considers it, without repentance, as a capital offense. The Bible is full of similar harsh laws if you’re looking for them. However, the application of such Biblical and Qur’anic injunctions is not to be outside of due process of law, in a place or land where such law is accepted and applied by the society as a whole. You got that? He doesn’t want to personally kill Rushdie, he just wants the government to do it, after a fair trial. Lovely. Yep, Beck’s was bigger, but Stewart has nothing to be embarrassed about. First, if you are inclined to watch the Jon Stewart/Stephen Colbert Rally, The Blaze has live coverage, here. And as of this writing, all it is, is music which I admit I am digging on. I personally am on record saying that I don’t care about crowd size in protests. But if you are morbidly curious, I haven’t seen any photographs of it, but the AP has written “people assembled by the tens of thousands Saturday” although that reportage seems a little premature. On the other hand, on the Facebook page it is right now listing about 10K definitely attending, about 100K “maybe” attending, exactly 10K awaiting reply (weird), and over 240K saying they will definitely not attend, for what it’s worth. Why do journalists keep writing the RSVP number like that? Look at the Facebook page. The number who say they are attending is (currently) 10,019. 239,164 RSVP’d to say they are not attending. 112,812 say — are they just being polite? — they are “Maybe Attending. Anyway, watching it, and seeing that Comedy Central is running it live—indeed, according to my TIVO, there will be no commercial interruptions, and there haven’t been so far—I realized that none of this would have been possible without the Supreme Court’s ruling in Citizen’s United. This is corporate speech. Comedy Central is a corporation, a subsidiary (most likely through multiple shells) of Viacom, another company, donating it’s on air time to this political rally. But according to Jon Stewart and Stephen Colbert, the government should have the power to ban this kind of thing. Mind you, of course, that is only my reading of Colbert’s satiric remarks; I believe what he is trying to do is say the Supreme Court is wrong to say a corporation deserves any first amendment protection at all, but since his satire is so thick rational minds can disagree. Stewart’s mockery, meanwhile, is a little more straightforward and it’s easier to discern his point. As for Stewart’s rally, hey, more power to him. We all want to restore sanity. Fiscal sanity, regulatory sanity and so on. That is why I am voting Republican next Tuesday. Update: Did some pinhead really say that outside media was banned from the rally? So then some radio host says to his listeners, more or less, “Hey, why don’t a bunch of regular people, my listeners, go and register as official write in candidates?” And they did, well over one hundred of them. You can read the list, here. Now there are several Lisas and at least one other “Lisa M.” (its her middle name) and a few Polish-sounding names that end in “ski.” So this might actually have set her back. Heh. I wonder if calling her “Murky” would count? Since then I have learned that Dan Reihl at Big Government also made a similar solicitation, which was promoted by Conservatives For Palin, so who knows who had the most influence. Murkowski campaign spokesman Steve Wackowski tells Salon that “Operation Alaska Chaos” could cause problems for people in Alaska — including native Alaskans — whose first language is not English. The Murkowski camp is distributing wristbands, cards, and buttons with the candidate’s name to assist write-in voters. Murky, let me tell you, I am dyslexic, and you can go to Hell for trying to invoke the serious issue of disability discrimination for your petty political ambitions. Guess what? Daddy can give you that Senate seat, but he can’t guarantee reelection. There are a lot of juicy things in this, like his claim that Sotomayor is “not nearly as smart as she seems to think she is.” So let me suggest you read the whole thing. Also, Bench Memos has Tribe’s response to this letter becoming public, and mocks it. I am going to open the floor here, because frankly I can’t keep track of all the stories flying around. That seems to be referring to the story found here. Hot Air has also been keeping track of the story. There appears to be some printer ink cartridges containing no explosives, but made to look like they are. But with that breaking news email I think maybe at least one real bomb has been found. So if you got a clear idea what is happening, I want to hear it in the comments, preferably with links. And maybe the answer is, no one knows, except hopefully for our President and the people on the ground. Exit question: this comes on the heels of a story about a man planning to bomb the D.C. Metro and another man shooting up Marine Corps-related facilities. Is this all a coincidence? Page loaded in: 0.2053 secs.